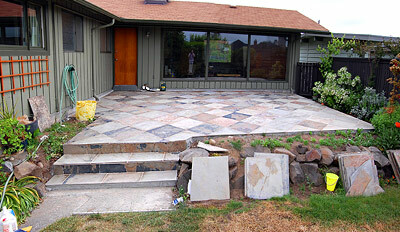 We Just finished applying a layer of 24” x 24” slate tiles to our back patio. It was a straight-forward enough tiling job, but the scale of it has me feeling like i just finished building the pyramids or something. But I think that it was worth the effort. Just had to show it to you. Prior to laying the slate, we dug up some unwanted lawn, extended the existing slab and widened the staircase to provide some extra area for outdoor livin’. Link to before and after photos on flickr. This entry was posted on Monday, June 2nd, 2008 at 8:35 pm	and is filed under Miscellany. You can follow any responses to this entry through the RSS 2.0 feed. Both comments and pings are currently closed. Looks great, guessing it’s 24′ x 24′ though! I guess now would be a good time to mention that I *am* in fact available for some outdoor BBQ parties this summer. Hey Ken! We have vowed to have at least one! You will be invited.